The Cherusci lived in areas of the northern Rhine valley, extending eastwards into the forests of north-western Germany. They may have been named after the hart, or deer, *herut in ancient Germanic. Established in the Rhine valley from as early as the first century BC to at least the third century AD, their name may not be Germanic, perhaps instead being used by their enemies or neighbours to describe them. They were mentioned as a tribe of the Germani by Julius Caesar in 53 BC, where he distinguished them from the Suevi, and were subjugated by Rome in 12 BC. The Germanic Cherusci encounter Rome for the first time, in the form of Julius Caesar, and are already established in their northern Rhine Valley homeland. Caesar identifies them separately from the Suevi when crossing the Rhine to punish the latter for aiding Gallic tribes. He states that the Bacenis forest divides them from the Suevi. The Cherusci are subjugated by Rome, along with some of their neighbours in the first of four campaigns let by Nero Drusus, stepson of the emperor, who is appointed governor of the Rhine region of Gaul. After building a fortress on the island of the Batavi, he undertakes some difficult fighting in which he is generally successful, subduing numerous tribes. He progresses as far as the River Elbe, where he builds boats and sails to the North Sea. He is killed in a fall from his horse during the fourth campaign in 9 BC. King of the Cherusci. The original 'Herman the German'. Cherusci noble and rival contender for power. King in AD 21. Arminius (known as Herman Siegfried to modern Germans) declares the independence of the Cherusci from Rome with his decimation of three legions under Roman Governor Publius Quinctilius Varus. He achieves this momentous victory in an alliance with the Bructeri, Chatti, Chauci, Marsi, and Sicambri (a coalition that is sometimes, rather ridiculously, termed the Armenian empire). The Tencteri and Usipetes are also highly likely to be involved, as are the Dulgubnii, subjects of the Cherusci. The Bructeri, Tubantes and Usipetes certainly team up to harass the troops of Germanicus AD 14, and they are later included in his triumph. Segestes, whose daughter Arminius had married against his wishes, bears Arminius a lifelong grudge and this now flares up into open division. 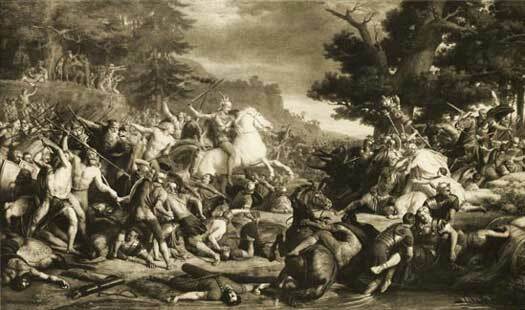 Germanicus invades northern Germany with Segestes as an ally, and they start with the massacre of the Marsi. This enrages the Germanic tribes and Arminius' confederation is reformed willingly. After Roman forces (and Batavi allies) relieve Segestes from a siege which is being conducted by Arminius, Segestes hands over his pregnant daughter and she is taken to Rome where her son is born (he later trains as a gladiator and dies in combat before he reaches the age of twenty). The Cherusci suffer two defeats in this period, the first being at Idistaviso and then at the Battle of the Angrivarian Walls in the summer. Arminius doubtless finds his authority has been damaged by the second defeat, at least. War breaks out between Arminius and Maroboduus of the Marcomanni. The cause is Maroboduus' decision not to join the Cherusci-Roman war of AD 9 in common cause with his fellow Germans. Now the Cherusci join with some of Maroboduus' own Suevi subjects, the Langobards and the Semnones, to stage a revolt against his power. Following an indecisive battle, Maroboduus withdraws into territory that later forms Bohemia by AD 18. He is overthrown by one of his own nobles the following year. Segestes and members of the royal family murder Arminius, destroying Cherusci cohesion and allowing the Romans to appoint a client king. Following his appointment, Rome largely leaves the Cherusci to their own devices. Son of Arminius. Died as a gladiator in Rome. Father-in-law of Arminius. Roman client. A request is sent to Rome asking that Italicus be sent to serve as king, after the nobility of the Cherusci has been destroyed by internal conflict. Whether or not Segestes is killed before this point is entirely unknown. The new, Roman-educated prince soon falls out of favour with his people and they attempt to expel him. The Langobards, previously a minor tribe under the dominance of the once-mighty Cherusci and Marcomanni, now appear on the scene with enough authority and strength to impose the restoration of Italicus. Nephew of Arminius. Roman client. Soon fell out of favour. King at the time of Tacitus' Germania. Cherusci numbers and fighting ability have been dented through unsuccessful warfare against the Chatti. This point signals their eclipse and eventual absorption by other tribes. Emperor Hadrian spends much of his career consolidating the Roman empire and securing its borders. This includes the building of limes, or defensive works, along the Rhine to keep out possible future Germanic incursions, although it is probably Hadrian's successor, Antoninus, who completes much of this work. The Germanic Franks are first documented during this century (the Period of Migration), when they are to be found occupying territory on the Lower Rhine valley (on the east bank, in what is now northern Belgium and the southern Netherlands). They are one of several West Germanic federations, and are formed of elements of the Ampsivarii, Batavi, Bructeri, Chamavi, Chatti, Chattuarii, Cherusci, Salii, Sicambri, Tencteri, Tubantes, and Usipetes. Most of these peoples live along the Rhine's northern borders in what is becoming known as Francia. The fortunes of all of these tribes are now tied to the greater Frankish collective. Elements of the Cherusci and their subjects, including the Dulgubnii, are also in the process of being absorbed into the Saxon tribal confederation. They disappear from history as an identifiable people.